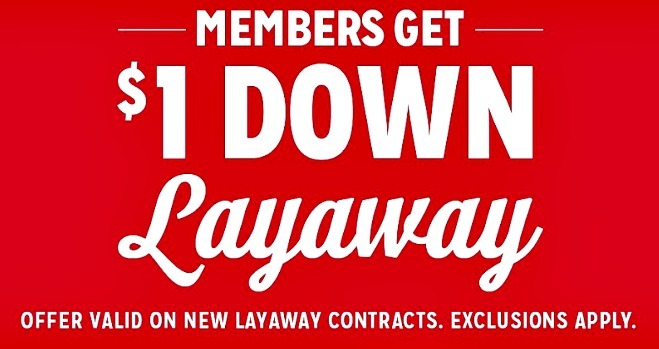 Kmart is offering $1 down layaway plans for Shop Your Way members who want to pay over time. Shop Your Way is free to join and you will also earn points on qualifying purchases. If you are not a Shop Your Way member, the fee is $10 to start. For just a dollar online, members can take advantage of online Layaway. You can layaway items both in stores and online. Kmart layaway requires down and biweekly payments. All fees nonrefundable. Cancellation fees apply. No cancellation fees in Ohio. Not available at all Kmart stores. 12-week layaway option available only on in-store purchases of $300 or more. Exclusions apply. See associate for further details. ** If there is no Kmart near you, you can still check online to see if the items you want are layaway eligible and can be shipped to you when your layaway is paid in full. You can start a layaway contract at Kmart online for one dollar. The length of the online layaway contract is 8 weeks. Add items to your cart and go to checkout. Arrange to pick up your items at your closest Kmart. Go here for complete rules from the Kmart.com website. Make payments every two weeks online, or at any store with cash, check, debit or credit card and arrange to pick up your items at your closest store once your last payment is made. Apparel – The whole family can get in the spirit in style with Kmart-exclusive celebrity powerhouse brands. Home – Kmart offers a wide selection of affordably priced home accessories and small kitchen appliances such as Disney “Frozen” themed bedding and the Keurig® single-cup coffee maker. Toys – Parents can get a head start nabbing Kmart-exclusive hot holiday toys, including My Little Pony Equestria Girls Rainbow Rocks Mane Event Stage Playset by Hasbro®, Transformers Age of Extinction Optimus Prime and Grimlock 12-Inch Electronic Figures by Hasbro®, WWE® John Cena 31” Figure by Wicked Cool Toys® and Zoomer Dino by Spin Master™. Consumer electronics – Members and customers can gift the newest electronics like Xbox ONE, PlayStation4®, 32″ to 60″ RCA TVs and Samsung Galaxy tablets. All fees are non-refundable. Service and cancellation fees apply. Go here for complete rules from the Kmart.com website. Make payments every two weeks online, or at any store with cash, check, debit or credit card. You can sign up to get Layaway Payment Text Reminders and you will be sent a link to easily and quickly complete the sign-up process. Text LAYAWAY to 56278. Arrange to pick up your items at your closest store once your last payment is made. Walmart’s New Layaway Plan – How Does It Work?